Mushrooms reproduce by making billions of spores that spread and grow into new organisms. You can take advantage of this phenomenon to make a beautiful print on paper. This portabello mushroom is good for making spore prints. This shiitake mushroom may be a little old—notice the brown spots on the cap’s edges—but should work. First, you should remove the stems. I use scissors so I don’t pull up or damage any of the gills. Place the mushrooms with the gill side down on a piece of paper. 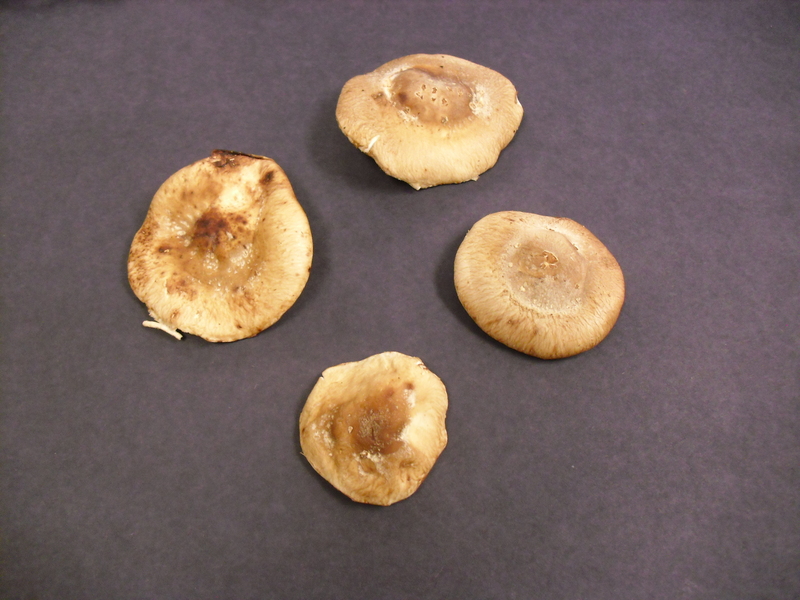 Mushrooms with dark gills, like portabellos, have dark spores that show up well on white paper. Shiitake mushrooms have white gills and spores that will show up better on black paper. 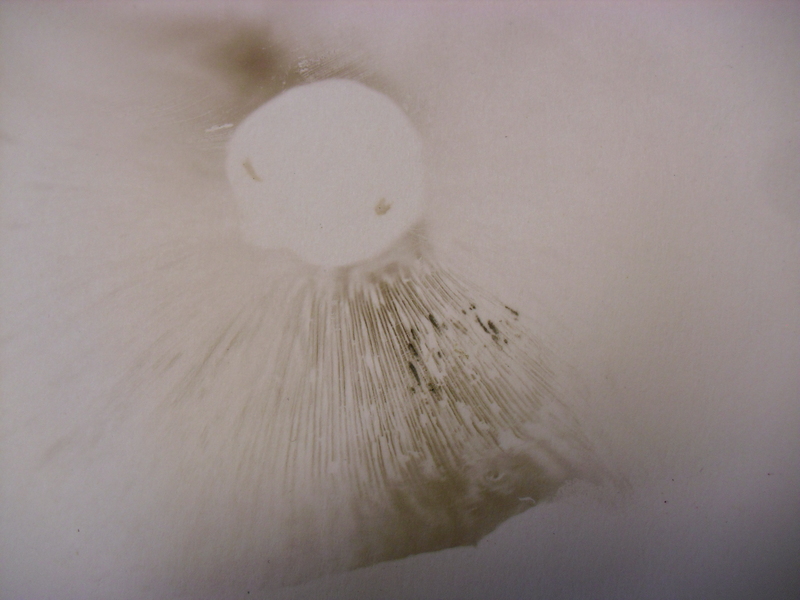 Some mushrooms make both dark and light spore prints. These four shiitake mushrooms were placed on black paper. They will be covered with a bowl and then left overnight. Place the paper on a tray or other surface that can handle something wet sitting on it because moisture from the mushrooms will soak into the paper and anything underneath it. Cover the mushrooms with a bowl to prevent them from drying out. Really ripe mushrooms will make a print in an hour, but I suggest that you leave them overnight to be sure you get results. In the morning, carefully lift your bowl and the individual mushrooms and see what you get. If the paper absorbed a lot of moisture from the mushrooms, it may need to dry before you see the print very well—especially prints made on black paper. Portabello prints often show well-defined gills. 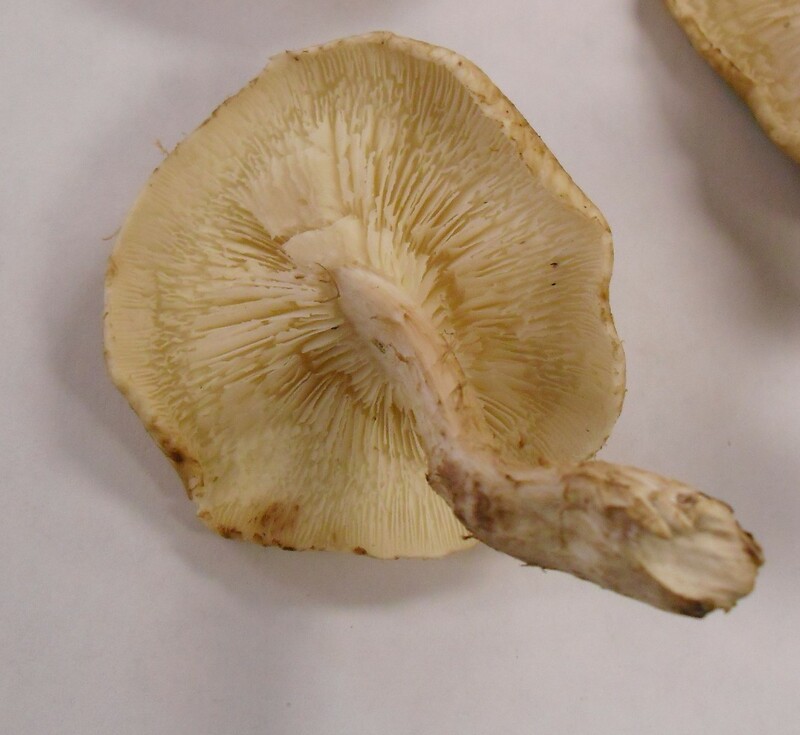 Shiitake gills are not as straight and rigid as portabello gills, so you’ll get less gill definition in the print and a more wavy, swirling print. If your mushrooms are too wet, or are starting to rot, you’ll get more of a watercolor effect instead of a sharp print. 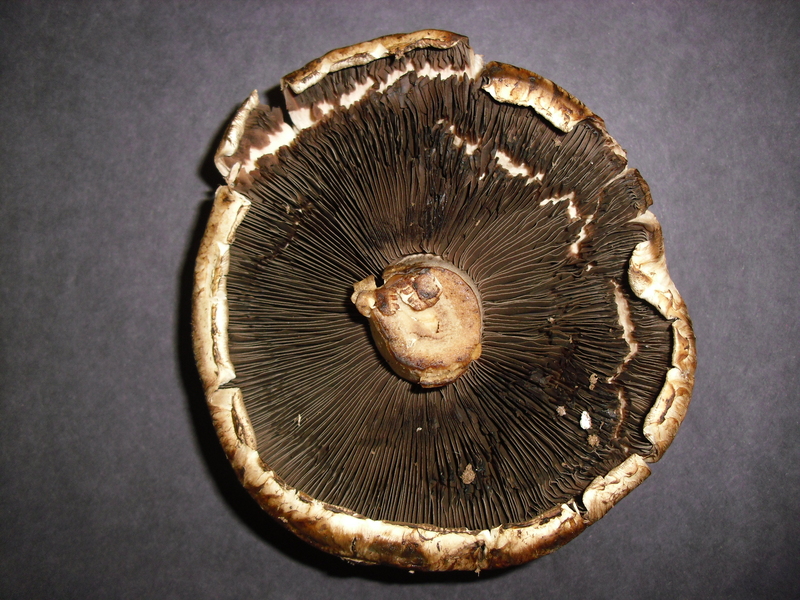 If all goes well, billions of spores will fall from the mushroom and produce a pattern that resembles the gills on the underside of the cap, like this portabello mushroom print. 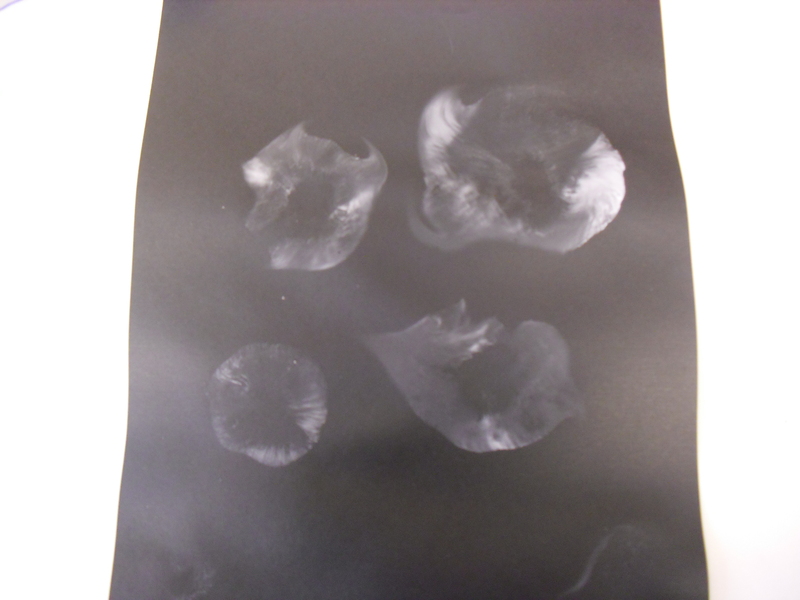 Four shiitake mushrooms leave ghostly impressions on black paper. The swirled edges were made by the uneven surfaces of the mushroom caps. The fine lines on this print look like they might have been drawn by an extremely sharp pencil, but the spores that compose the image are much smaller than the tip of a pencil. Garden scientist Louise Egerton-Warburton recently told me, “Plants are cool, but fungus rules.” As a mycologist, fungus is her passion. Now, we aren’t really interested in competition or ranking organisms by levels of interest or importance because every living thing needs the others to survive. But the fact remains that we tend to forget about smaller things, especially those that tend to be hidden from view, so let’s take some time to meditate on mushrooms. 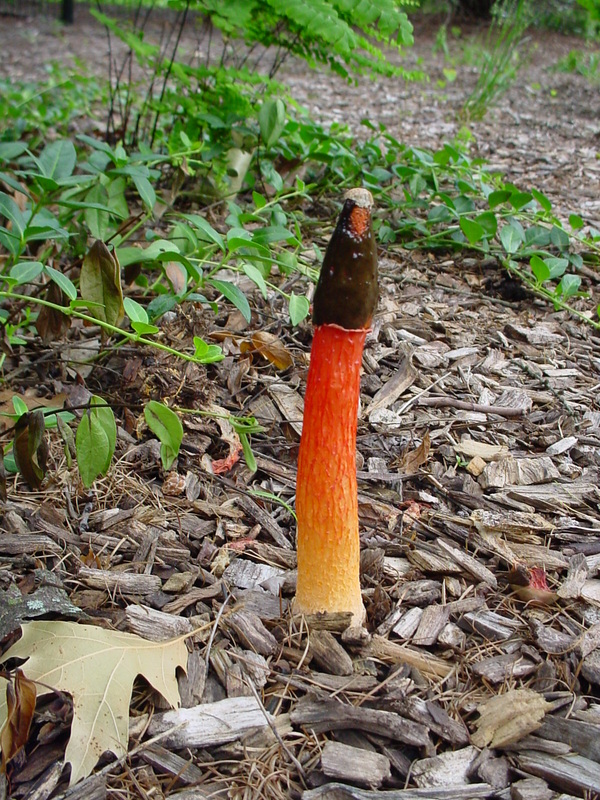 This stinkhorn fungus, Mutinus elegans, is growing out of the ground, but that is where its resemblance to green plants ends. It’s named for its obnoxious odor, which attracts flies that help distribute its spores. Scientists used to think of mushrooms and other fungi as special kinds of plants. The problem is that, unlike plants, fungi do not get energy from photosynthesis. They are composed of different kinds of cells, they complete a different life cycle, and let’s face it: they don’t really even look like plants. So fungi are now grouped in their own kingdom of organisms, and nobody expects them to be anything like plants. There are many different kinds of fungus, so for simplicity, let’s just think about the familiar mushroom with its stem and cap. This structure is actually the reproductive part of the organism, in the same way fruit is a reproductive structure in plants. (But we are not comparing plants and fungus!) 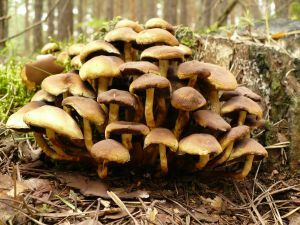 Beneath the soil where you find mushrooms growing, there is a network of branching thread-like structures, called “hyphae,” which grow through the dead plant and animal matter in the soil and absorb nutrients. This is the main “body” of the fungus. As the fungus digests organic matter, it decomposes, making it useful for plants. 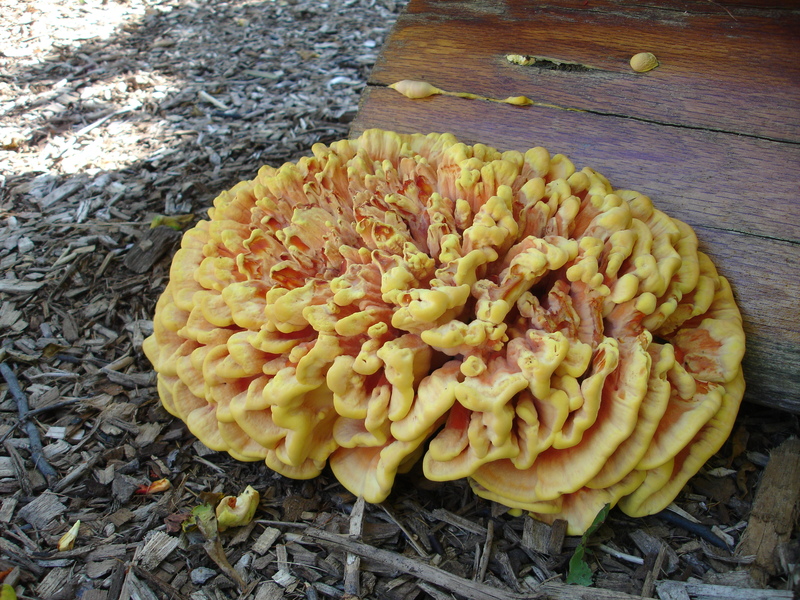 This “chicken of the woods” fungus, Laetiporus sulphureus, doesn’t look like a mushroom, but it also produces spores. The fungus that produces these mushrooms is decomposing leaves and sticks that have fallen to the forest floor. Back above ground, when conditions are favorable, a mushroom grows up from the hyphae. It matures and releases spores, which are like seeds. (It’s really hard to get away from comparing fungus with plants!) Spores are structurally different from seeds, even though they function to spread the organism in a similar way. Spores are microscopic and are so small that mycologists measure them in microns. A micron is one millionth of a meter. 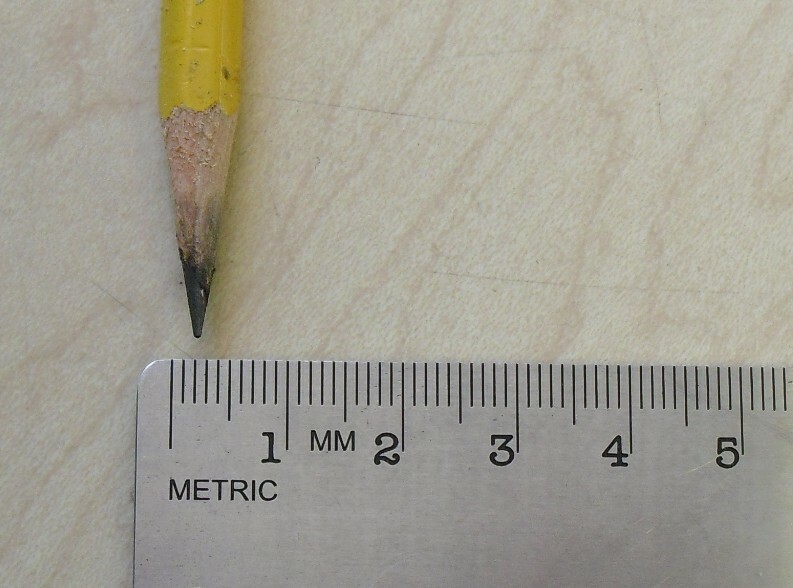 How many spores could fit on the tip of a sharp pencil? A lot! 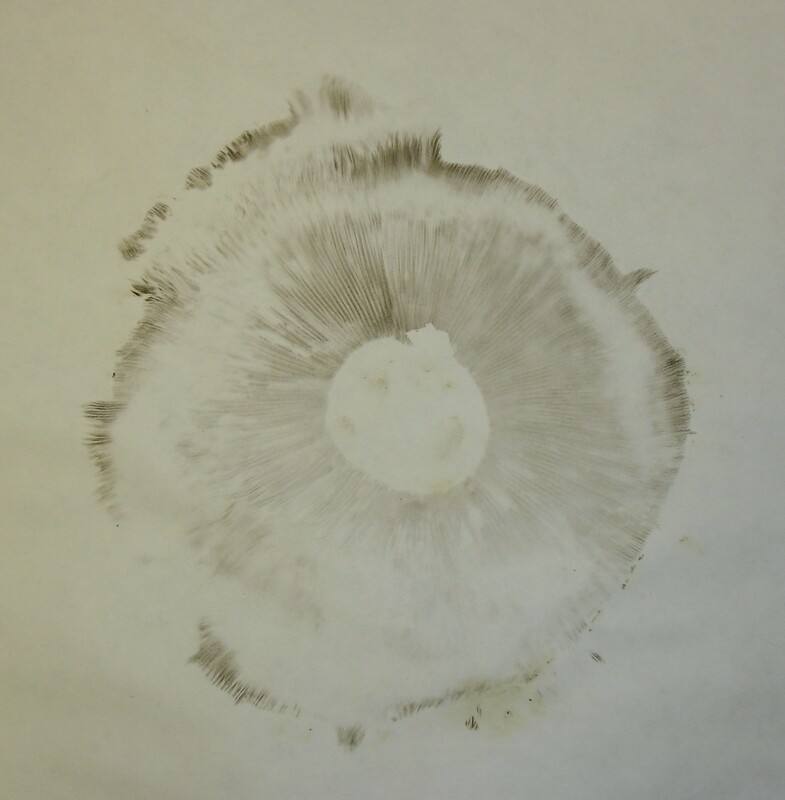 No wonder the spore print is so fine and delicate! Look at a metric ruler. See the smallest lines that mark millimeters? Imagine dividing a millimeter into one thousand equal parts. Fungus spores measure 3 to 12 microns. It hurts my eyes trying to imagine a spore sitting on my ruler. We can only see them when there is a mass of them on a spore print. Mycologists use a micron ruler built into their microscopes to measure the individual spores. Tiny but essential: Fungus rules.